It gives a fairly high level list of tasks that should be considered at the start of a development project. It covers both security and more governance type issues. It is divided into a number of categories. Under each category, there are a number of tasks. Use it just to browse the list of tasks and maybe spot some item which you had not already considered.. You can do this through your browser. 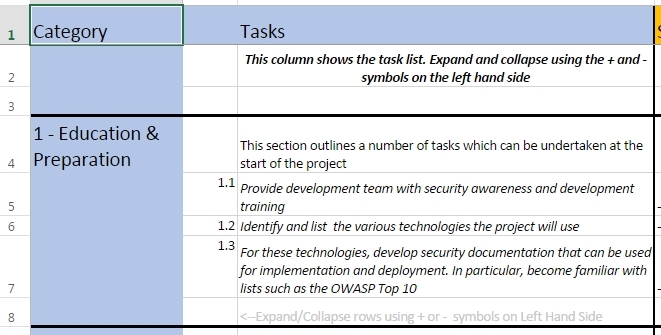 The task list itself is in tab 2 - Task List in the spreadsheet. You can also download it as an Excel spreadsheet and modify it in Excel. Use the Open in Excel or File|Save As options in Excel Online for this. Columns D to G could come in useful here to track what needs to be done. 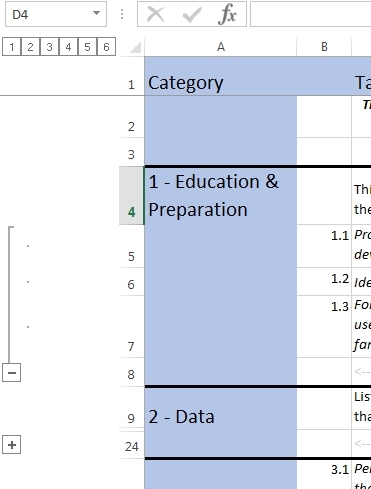 Use the Excel Expand and Collapse options on the Left Hand Side to show and hide the tasks. Note: This is currently in Beta mode. "Even a casual observer of computer security must notice the prevalence of FUD :non - falsifiable claims that promote fear, uncertainty or doubt (FUD)"
It is short at 5 pages and well worth reading. The new EU Data Protection regulation took another step on its long road towards becoming law. What does this mean for application design and security? Originally proposed by the EU Commission in January 2012, the EU Parliament has now supported it (with lots of amendments to the original proposal). The next step on the long road is the EU Council of Ministers. Who knows when/if this becomes law, but it is worthwhile being aware of it. It is long and complicated and will change. What could this mean for application design and security? Here are some of the proposed amendments which may impact your application design and security when processing personal information of EU citizens. These are just the barest details based on the amendments proposed by the EU parliament. There is more information in the links below. In this amendment, the data subject can request that any information be corrected. For the application developer, this means that there should be some way to correct personal information that the application stores. The data subject can request that their personal data be deleted. There are various conditions around this. Basically it means that application should have the ability to delete a user's information at their request. This is a core article from a security perspective. It talks about "protection by design", "risk", "entire lifecycle management of personal data from collection to processing to deletion". Security of personal data cannot be an afterthought. It must be considered from the start of the application design. This article essentially means that the application must keep an audit trail. It even mentions such items as "date and time". "implement appropriate technical and organisational measures and procedures to ensure a level of security appropriate to the risks represented by the processing and the nature of the data to be protected, having regard to the state of the art and the cost of their implementation." Again this clause mentions risk. The article itself lists a number of more detailed requirements covering such security measures such as access control etc.